Evolution and Diversity: Are We Prepared For Global Warming? Are We Prepared For Global Warming? As we all know global warming is inevitable. We can slow the process and reduce the damage done by lowering greenhouse gasses and emissions, but planning for our future climate is a necessity. Have you ever wondered how our essential crops, that we depend on as a source of food, will be effected by global warming? An article I recently read explained that scientist have been studying how plants can naturally evolve and adapt to new environments and conditions. 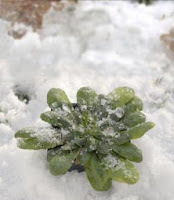 Typically plants use a natural process called vernalization to determine approximate lengths of the cold of winter to predict the most appropriate time to flower. This process can vary greatly depending on the plants geographic location. Some plants need much longer lengths of cold than others before they initiate flowering. Researchers believe that these adaptations evolved very quickly and hopefully they can reproduce adaptations that could survive through extreme conditions. These adaptations would allow our crops to thrive even if significant temperature changes occured. Although I am opposed to genetic modifications I believe that this is one that will eventually be essential to the survival of the human race. I am glad that someone is actually recognizing the fact that global warming is happening and doing something about it instead of just playing it down and ignoring it. We need to remember that our planets equilibrium needs to be balanced in order to maintain life, one kink in the chain of an organisms food source could be devastating overall. Genetic modifications could change something but I also believe that our landscape will change. Invasive species could totally turn the ecosystems around...I am not looking forwards to these changes!